Hello fanittin’ enthusiasts! Dave here with this week’s FNITN (Funny Names In The News) update! Today’s post is a special one, because I’m writing it while floating on a cloud after pulling off one of the greatest accomplishments of my life. What was it? Completing the MCAT… no. Applying to medical school… wrong again. Last night, while hanging out with Arto (and about 10 other people) celebrating our friend Brittany’s birthday, I managed to get a live band to play Merle Haggard’s “Okie From Muskogee” to a bar full of Californian 20- and 30-somethings. It was quite the accomplishment. 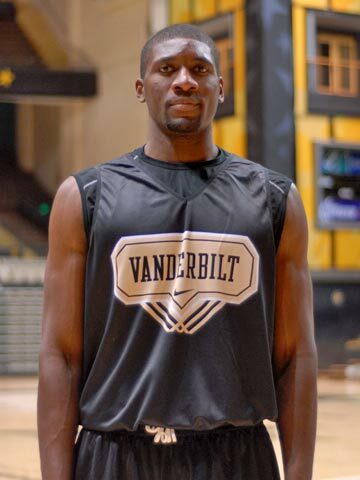 Festus Ezeli (full name: Ifeanyi Festus Ezeli-Ndelue) was drafted 30th in this year’s NBA draft by the Golden State Warriors. He is renowned for his genius-level intelligence (he was once described as someone who could have been the “Nigerian Doogie Howser“), and I hope he can at least get some amusement out of the irony of his situation. I kind of feel bad for the guy. Normally, if you’re drafted early in the first round, you get a big paycheck and play for a horrible team, while those drafted later earn less money but get to play for contenders. Festus managed to be the last pick of the first round and end up with the cellar-dwelling Golden State Warriors… I guess if anyone can make the best of that situation, it’s the Nigerian Doogie Howser. I’m sure making half a million dollars a year as a 23 year old has its perks too, though. Apparently Arto decided that this would be a good week to read about the proceedings of the New Jersey state assembly, and passed this link on to me. I personally like this article for its usage of the term “Pot Punishments” in the title. Say that phrase out loud once – it’s kind of funny when you ruminate on it. Anyway, I couldn’t care much either way about New Jersey’s pot punishing policies, but the article was written by a guy named Andrew Duffelmeyer, which is a funny name, and therefore gels with the very subtle over-arching theme of this blog. While I’m catching up with old episodes of my new favorite television comedy, NBC’s Community, I might as well mention that their English Memorial Spanish Center was named after English Memorial, “a Portuguese sailor who discovered Greendale while looking for a fountain that cured syphilis.” A noble name for a notable pursuit. Aquaman’s favorite tennis player, Mardy Fish, was pushed to the max at Wimbledon the other day. Personally, I prefer the shortened URL ending in “wimbledon-mardy-fish-pushed-max,” but I’m sure Max wasn’t as keen on it. 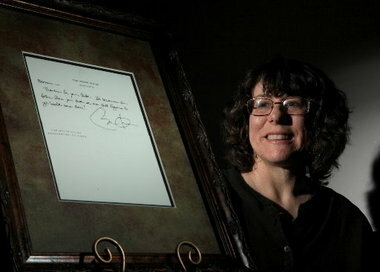 Natoma Canfield, with a letter from her favorite funny-named president. While we hate to pollute our Funny Names In The News articles with, you know, actual news, there is a name so exceptional that it supersedes our usual “absurdist news or bust!” insistence. Everyone’s favorite funny-named current U.S. President, Barack Obama (who is being given a run for his money this election by Willard Mitt Romney) has a knack for introducing random people with bizarre names in his speeches – consider, for example, Chaka, Temerria or Andoni. However, after emerging victorious on the biggest Supreme Court decision in years, Obama decided to outdo himself in his presidential address, by mentioning everyone’s favorite figurehead/cancer patient Natoma Canfield (of Canfield, Ohio). Say what you will about America, but there’s a lot to be said for a country where people can name their daughter Natoma and have her reach the point where she’s mentioned in a speech by a sitting president named Barack. Congrats Natoma on a landmark decision that went in your favor! Mardy Fish and Jack Sock would make a great funny name doubles team! They definitely would! I just looked up Jack Sock and saw he was born in 1992. That seems ridiculously young! That’s the next one in my queue! I’m excited! Frankly, I can’t decide which ones are my favorites – I enjoy them all except for the weird claymation one. The Foosball one and “Pillows and Blankets” hold a special place in my heart for their funnynameology, and the six parallel plots one was fun too, and I loved Britta’s improvised “Pizza dance.” Speaking of Britta dances, the one I saw a few days ago where they join the Glee club was pretty fun too. Man, they’re all so good! I’ll be sad when I run out of episodes in a few weeks, and I hope they decide to do more than the scheduled 13 next year. I don’t know if I can handle the withdrawal. Six seasons and a movie!! Haha, I think it’s my turn to *swoon*. I am in awe of your Community quoting skills! There’s no such thing as a bad time to read about the proceedings of the New Jersey State Assembly. I mean, that whole institution right there is a borderline funny name. Props for my man Duffelmeyer for dutifully covering it in all its glory. So did he also cover the assembling of the state of New Jersey? You are a fine research journalist! Keep up the good work. And don’t feel bad for Festus Ezili. I myself was not drafted to a contending level NBA team either. The Warriors have a nice team. Yeah, all in all, Festus seems to have a pretty good life. I also wasn’t drafted to a contending level team – being drafted instead by the CBA’s Minot SkyRockets (which probably would be good on a companion “Funny Sports Team Names” blog) before the league went defunct in 2009.
the league never went defunct, because it lives on in all of our hearts. Natoma and Obama … seriously, you couldn’t even make it up. I’m happy that her 15 minutes have been so positive. Great post as usual. I know, it’s the stuff dreams are made of! Thanks for the compliment as well!